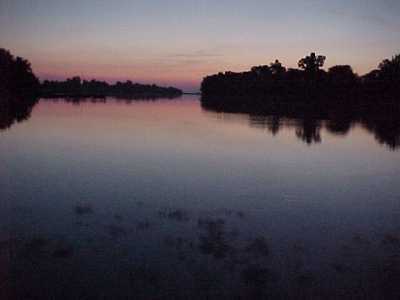 -----This beautiful waterway connects the St. Lawrence River with Lake Champlain. 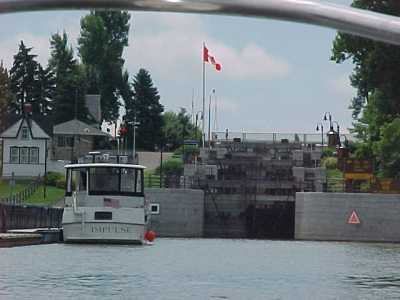 The locks are easy to traverse and mostly hand-operated. The countryside is pastoral and the small towns interesting to visit. -----A smear of brown water poured into the St. Lawrence at Sorel. We turned hard a' starboard, into the muddy swirls and followed them upstream. 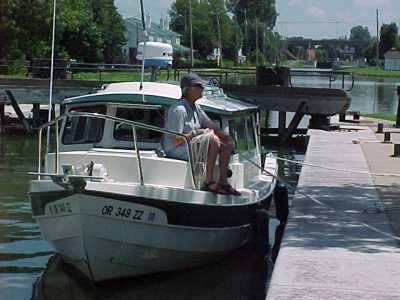 We soon entered the Richelieu River, hidden behind shipyards and commercial buildings. -----As we went up the river, it soon became residential and beautiful. The houses are interesting and well kept. Every once in a while a gay splash of color (brilliant yellow, purple, carmine red) on a house reminds one that this is French Canada. We locked up the St. 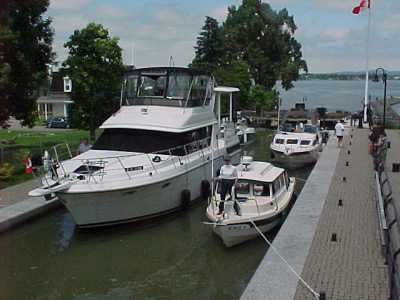 Ours lock with ease - there is floating dock inside the lock to tie - marvelous and easy. -----That evening, we hooked along the edge of the river. The next morning, dawn began through a thick fog. We ate our brekkie as the mist swirled off the river. By noon, we had reached the Chambly canal. The first "step" is a flight of four locks. We locked in beside a big boat from Vermont with inches to spare - I was nervous we would be crushed if it swung in the current. -----"Lighten up, Bill. They'll hold the lines," El said with a smile. Remember, she's the risk-taker. It soon became easy to relax. The other boats in the lock were French-Canadians and they were having a raucous good time - with loud music playing, bikini-clad women dancing on the foredecks, and beer flowing. It was fun and part of the culture. -----The lock tenders (many women) were friendly and fun kids. It was hard work, since the locks were hand-operated in the traditional fashion. The locks had flowerpots and were neat as a pin. We went up eight locks in quick succession and then there was about an hour and a half to the last lock. 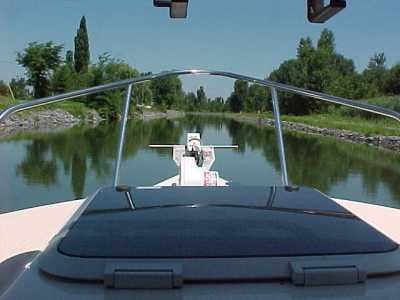 -----The big Vermont boat led the way at a leisurely 10 km/hr with the impatient Quebecois buzzing around behind with the beer flowing and the music playing. We brought up the rear - two American boats keeping the French-Canadians in line - and that's impossible. Musical Parade - Beside the Bike Path ----- You 're From Oregon? -----Finally, there was the last lock - we stepped down in our orderly procession, were given Canadian flag pins for souvenirs, and off we went up the river toward Lake Champlain. The Quebec boats were soon dots receding in the distance, but we could still hear the music and laughter. They know how to have a good time. -----After a quiet anchorage, we cruised past Fort Montgomery. It was 1816, and we had just finished another war with England. The Brits had again come down Lake Champlain, and we had again defeated them. 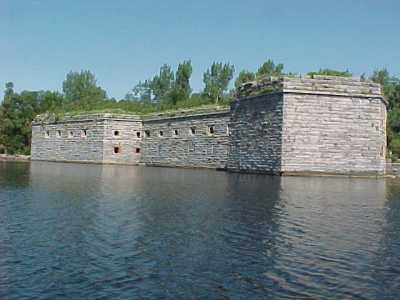 Our army decided to build a fort at the north end of Lake Champlain to (hopefully) prevent the next incursion. It was half-built when a survey showed it was on the Canadian side of the border! -----Work stopped - we were building a fort for the Brits. Then, when it was re-surveyed, it was discovered to indeed be on the US side of the line. Ft. Blunder was completed but never manned. -----We tied at a marina and cleared US Customs. We fueled and watered the boat and gave her a quick wash. Then we did the same for ourselves. First things first. -----"So here we are on Champlain again. We've closed the loop," El said, squinting at the chart in the slanting dawn light. -----"We could cruise here all summer. Maybe we're 'there.' Hard to find a nicer spot," I suggested. -----"Hey! Have you swallowed the anchor?" El said with a chuckle. "You should never ask if we're there yet. We're nomads, remember?" 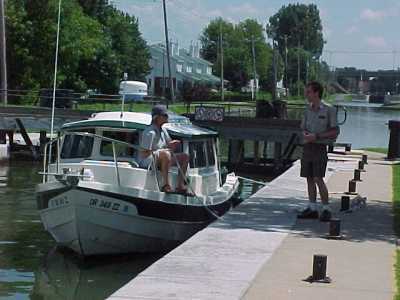 -----So, we cleared customs back into Canada that morning and headed north up the canals and Richelieu River. We were solo on our northern journey - seems the party was down south. I missed the laughter (and the bikinis). 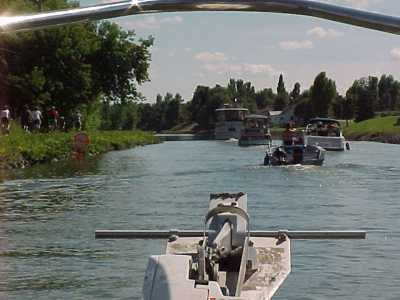 -----We have long-read of the much-storied canals of Europe, and even poked around on a few in England and the charming Canal du Midi in France. However, our little-known canals in North America are incredible. Our waterways, interconnected, exceed 14,000 miles! Here, in Quebec, it is far better than France - the locals all speak (sorta) French, the women are beautiful, the bread is marvelous - and we can use our cell phone! Oh, and the price parity of the dollar is far in our favor - especially compared with the franc.